Choice is EVERYTHING and now you can make your own ‘accessory’ decisions and be a little eco-friendly at the same time. 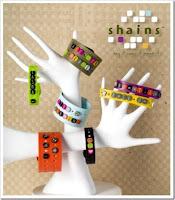 'Shains' are new customisable environmentally friendly accessories and jewellery for children, teens and adults which have interchangeable letters and icons for you to say what you mean and wear it proudly! You buy all the pieces individually (or in small packs) and then clip them onto arm bands or cuffs. • Product is recyclable when you are ready to go and get new ones. • Shainsware gives back a percentage of net profits to environmental organizations. Everything Shains produces is certified lead free.